News in Youth Services: Chocolate Chip Day! I LOVE chocolate chips! They're great in cookies, ice cream, pancakes, waffles, brownies and lots of other things. 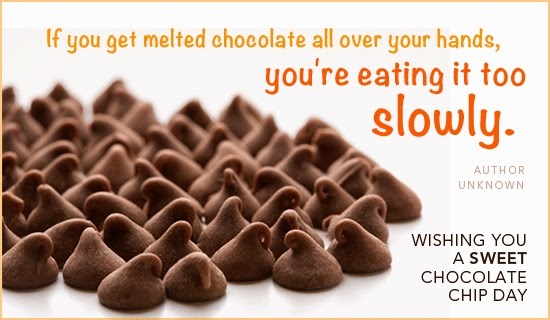 May 11th is Chocolate Chip Day. I intend to celebrate it by making some chocolate chip pancakes. Have you ever made chocolate chip faces in your pancakes? It's so much fun and delicious to eat. What a splendid way to start the day. Later in the day I'll need to make some chocolate chip cookies to share with my friends to help celebrate the day! Who put the cookie in the cookie jar? Not me, but I wish I had! It was Ruth Graves Wakefield, who in the 1930s created the original chocolate chip cookie at her Toll House Inn in Whitman, Massachusetts. She had run out of baker's chocolate so she decided to use chopped up semi-sweet chocolate morsels and discovered that the pieces didn't melt into the dough as she expected. It was the birth of chocolate chip cookies as we know them today! In the United States, 25% of all cookies baked are chocolate chip! In honor of the day, why not make some chocolate chip cookies with your mom, dad, aunt, grandma, etc? It can be a delicious dessert after dinner!